Here is a cue to on line Quiet time for this week end.
" When hair or nails over grow, only the hair or nails are cut, not the head or the fingers. Like wise, if there appear gaps in relationships, efforts are made to end the gaps, not relationships"
Do register your thoughts here. 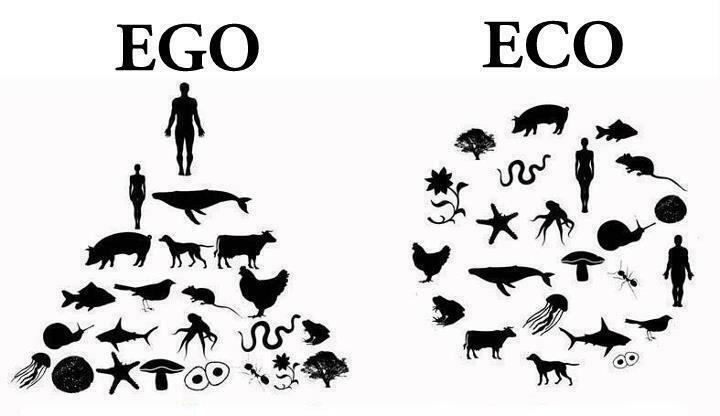 Earth Day, Today. Let's Make It Everyday. Since 1970, 22nd April is being observed as Earth Day. However, after 42 years, people at large are frustrated at the failures. The World was populated by 3.7 Bn people then ( and India by 555 Mn or 55.5 Crore). Today we are 7 Bn in the world, and 1.2Bn in India ruing over the failures by the Govts. The wise voices are emerging the world over that at individual level we need to take steps to save the Earth..., nay, to save ourselves on the Earth. The Earth will survive, we the human beings may not! There is an urgent need to take steps in our daily life, by observing Earth Day every day. And how should we observe? There are many many suggestions on the net, in the media.. But let us listen to our inner guidance, and follow it. Here is this week's Quiet Time trigger. Native of Cuba, it weighs just 1.8 grams and is not more than 5 cm in length. 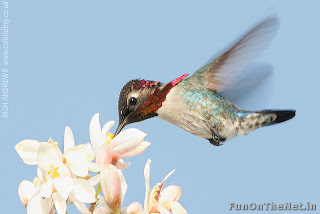 Flaps its wings for 80 times in a second and can remain stationary in the air like a helicopter. Let the thoughts triggered by this picture be shared here in the context of the crumbling ecology. You can register your thoughts underneath here by clicking on the icon 'comments' below. Exactly one month ago, on March 12, 2012 one more city got added to India I Care family. Thanks to Mr. Om Bagaria, an activist, a philanthropist and a senior citizen of Tezpur who went all out to get the influential forces of Tezpur together to make the Tezpur I Care a reality. The Initiatives of Change team comprising of Dr Ravindra Rao, Prof R Rajagopalan, Zooni Dash, Peno from Nagaland and I was invited to be in Shillong at the behest of Shri N K Kumar, IAS, of the Meghalaya Govt to create awareness about the environmental crisis and the India I Care movement, Mr Om Bagaria of Tezpur took this opportunity and invited us all to extend our journey in Assam for creating the same awareness. 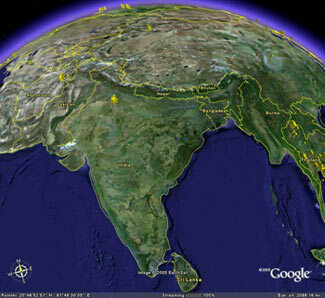 It is a matter of concern that not many Indians are much aware of the entire North East part of India. In many ways it was a great learning experience for us. Four days in Shillong followed by about eight days in Assam were very exhilarating days.We had an opportunity to meet and interact with people of different sociological,cultural and historical background. Mr Bagaria had fixed up our engagements with the students, staff and HODs at the University of Tezpur, the who's who and genaral public of Tezpur city, Students and staff members of IIT Guwahati, and the students and staff members of the Royal Group of Institutions, Guwahati. Coming back to Tezpur, we had a good exposure of this little historical town in two days that we spent. We met a newly married couple at the Agnigarh Hill, a neat little tourist spot on the banks of the mighty Brahmaputra, who described Tezpur as the cleanest city of Assam, and in the same breath the husband coming from Guwahati described Guwahati as the dirtiest. "Tezpur I Care, launched on 12th March, rekindles the initiative taken in August 1996 by Sri MGVK Bhanu, IAS, soon after he took over as the Dy. Comm. of Sonitpur District in Assam, to build an alliance between the district administration and the civil society for the public good. Concerned with the prevailing darkness on the Main Road—street lights having been switched off by the electricity board as a result of non-payment of dues by the municipal board—he entrusted the implementation of a street lighting scheme to the North Assam Chamber of Commerce & Industry (NACCI). The local MLA had offered a grant of Rs. 5 lacs for this project but Mr. Bhanu wanted to ensure that the lights would be maintained and energy bills paid timely on a sustained basis. This, he felt, would dispel fear and insecurity, so deeply entrenched then because of the prevailing insurgency. An agreement was signed with NACCI and the job was executed in under five months. For the last 16 years, the lights have been maintained and the system has been expanded to cover double its original length. Mr. Bhanu’s next brain child was Project Jyoti, once again implemented by Tezpur Municipal Board and NACCI. By now, thousands of CFL street lights have been erected under this scheme to brighten distant lanes and localities. Advertisements on kiosks affixed to the poles generate the revenue for maintaining the lights and cables. When he took up work on Chtralekha Udyan, he constituted the Tezpur Environment Society (TES), which has some district officials and many citizens playing key roles. Six parks are run efficiently by TES, kept clean and well-lit, adding to Tezpur’s charm as the city of eternal romance. Tourists from far and near now flock to Tezpur to enjoy the ambience of the Udyans. Tezpur I Care was inspired by the India I Care Movement and its vision is a Clean, Green, Serene Tezpur. Already work has been taken up to decongest the roads and to ban the use of polythene bags. Many more activities are planned with active involvement of the citizens and NGOs." We would love to learn periodically from Mr Bagaria about the progress they have made. We wish Tezpur I Care a great success. One can do quiet time on a picture too! 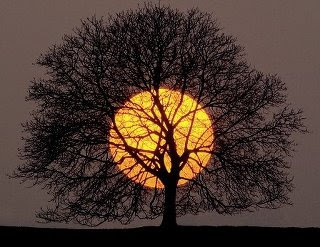 Here is a lovely picture, possible only during the present season. See what kinds of thoughts does it generate. If India I Care has to reach out to every leaf of the tree, then we have to cultivate many many branches which are connected to the leaves. Practically speaking, can each one of you, the viewers, become that branch which connects to the people within your circle of influence, and enroll them to the IIC? Can each one of you take up to send sms on week ends to these people asking them to make a fresh deposit into the Character Bank of India? Repeat that every week end. Presently Aswini from Hyderabad and Girish Babu from Bengaluru are doing it every Friday. They will be very happy that their tribe is growing. Please leave behind a comment if you are becoming a branch. Mr Rajasekhar, IAS was at Panchgani in the batch of November, 2011. He is in charge of SERP ( Society for Elimination of Rural Poverty) for the past 3 years. He immediately invited some of us to Hyderabad to see for ourselves the path breaking work being carried out for a worthy cause. 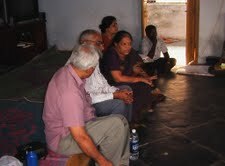 A team comprising of Kiran Gandhi, Suresh Khatri and Appal Raju visited Hyderabad, and a remote village in Kurnool district between 3rd to 5th April, 2012. 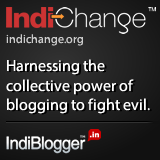 Kiran shared a brief report which I am reproducing here for a larger circulation through this blog. I believe this is a fantastic India I Care being carried out by Mr Rajasekhar and a whole lot of his colleagues and subordinates in SERP. Let us all appreciate this work and enhance their motivation further. I hope this finds all of you in a wonderfully warm spirit this summer. Further to my family and I visiting Nanded at Shri Nipun Vinayak's invitation, an IofC team comprising of Suresh Khatri, Appal Raju (from Jamshedpur), Lakshmi (from ASCI Hyderabad) and myself have just been to Andhra Pradesh at Shri Rajsekhar's invitation, for an exposure to the amazing work done over the last 12 years for poverty alleviation in the villages all over Andhra Pradesh through the Society for Elimination of Rural Poverty [SERP]. As you know, Mr. Rajsekhar has been heading this society for the last 3 years. The entire project has been operated by providing micro-finance for livelihoods generation to village women organised into self-help groups (SHGs), guided by trained community activists and community resource persons. We were told that one crore women, covering every village, have been enrolled into SHGs. We heard story after story of families lifted above the poverty line by women assuming leadership. In fact we found that they have achieved not just an economic revolution, but also a social revolution of women's liberation, breaking across communal and caste barriers. We were humbled by the live stories we heard and felt very thankful for the service to the nation IAS officers like Shri Nipun Vinayak and Shri Rajsekhar are rendering. We would be very happy to hear more such stories and to make visits to come and see you in your operating locations. SERP and IofC are now exploring some IofC training inputs for the SERP staff to sustain their effectiveness. 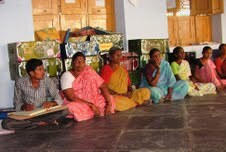 Attached are a few photos from our Andhra visit. Please leave here your comments for others to get encouraged. Though there was no response to my last week's QT-1, I thought I should not lose my heart.